Heat oven to 400°F. In 10-inch nonstick skillet, cook beef or chicken, stirring occasionally, until thoroughly cooked; drain. Stir in seasoning mix (from dinner kit), water and half of the cheese sauce (from dinner kit). Heat to boiling over high heat, stirring occasionally. Reduce heat to medium-high. Simmer uncovered 4 minutes, stirring occasionally. Stir in kidney beans and remaining cheese sauce; heat until hot. In ungreased 2-quart casserole, place 1 tortilla (from dinner kit). 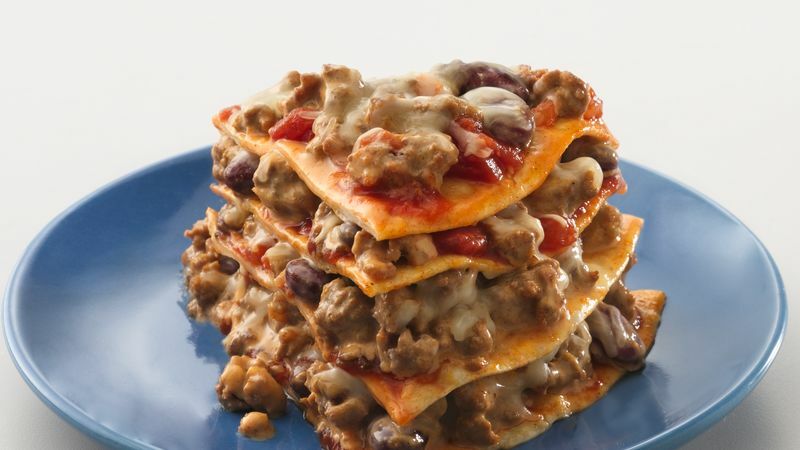 Layer with 1/4 of the salsa, beef mixture and cheese. Repeat layers, using up ingredients and ending with cheese on top. Cover; bake 17 to 22 minutes or until cheese is melted. Let stand 5 minutes.